driving home does take longer than driving to work in L.A.
At the April 11, 2018 Provost’s Undergraduate Symposium for Scholarly and Creative Work awards ceremony and banquet, three tables of enthusiastic attendees demonstrated wave after wave of spirit and pride as the evening program progressed. These spirited banquet attendees were USC Spatial students who, earlier that day in the Tutor Campus Center, had presented their posters to the USC community and for judging by faculty panels on their research with USC Spatial faculty funded by the Office of the Provost in the academic 2017-2018 year. As Dr. Andrea Hodge, vice provost for undergraduate programs, congratulated all researchers and announced the winners at the symposium celebration held at Town and Gown, the USC Spatial students had reason to cheer, trade high-fives, and hug one another throughout the ceremony as they and their sponsoring faculty were recognized for their participation and accomplishments. Haoshi Joanne Wang (B.S. in GeoDesign): “Suburbanization and Spatial Inequality in Indian Housing Market” (Dr. Jefferey Sellers). Eliza Gutierrez-Dewar presents at the April 11, 2018 Provost’s Undergraduate Symposium for Scholarly and Creative Work. 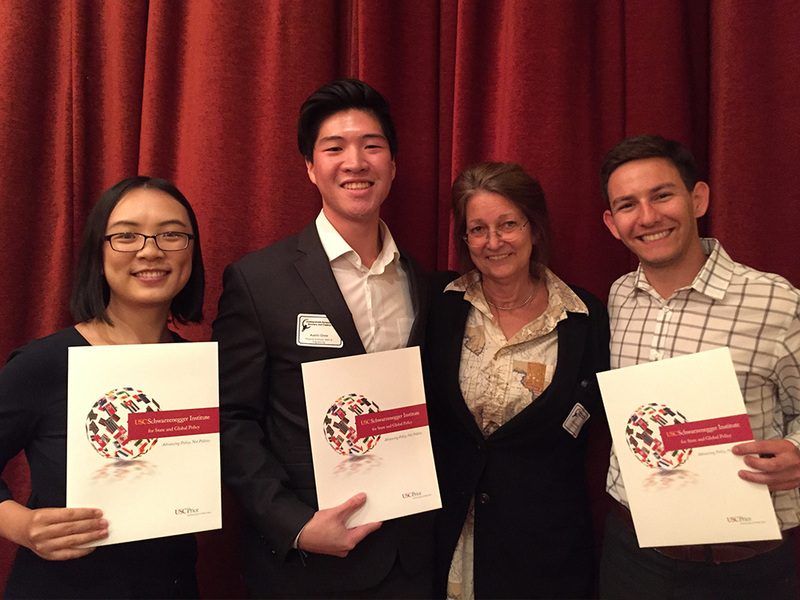 The USC Schwarzenegger Institute for State and Global Policy First Place Award: Austin Chow, Haoshi Joanna Wang, and Richard Windisch. 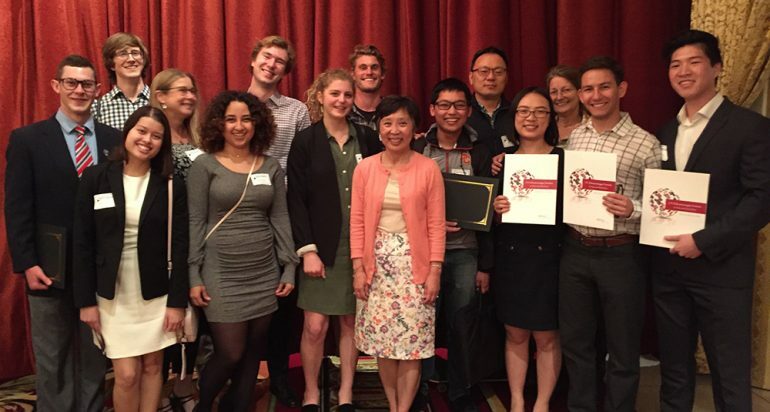 The USC Spatial “Stormwater Team” took the USC Schwarzenegger Institute for State and Global Policy first place award. (L-R): Haoshi Joanna Wang, Austin Chow, Beau MacDonald, and Rich Windisch. Beau McDonald, USC Spatial GIS Project Specialist, has been overseeing the “stormwater team” and works closely with all USC Spatial undergraduate researchers. “At USC Spatial, we emphasize that our research teams are interdisciplinary collaborations designed to allow faculty, postdocs, visiting scholars, staff, graduate and undergraduate students to conduct primary research as equal partners – and we mean it,” explained McDonald. 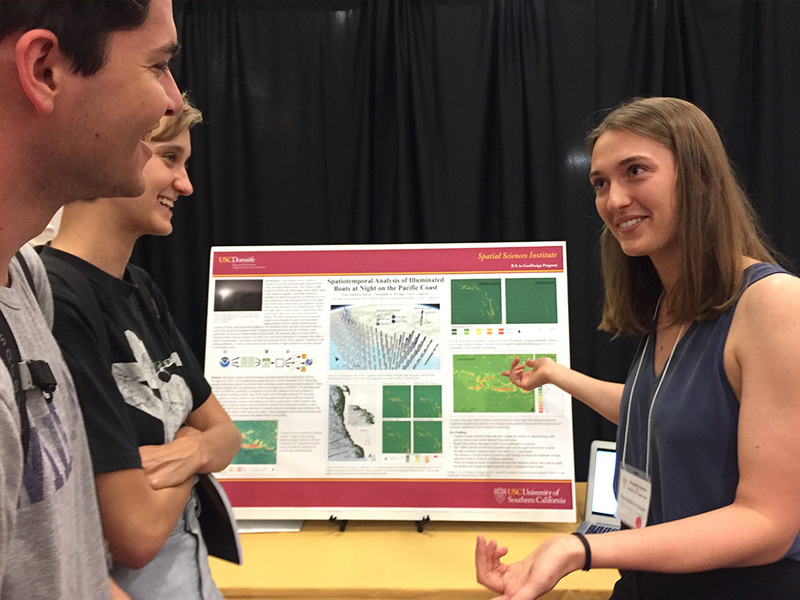 For more information about the 2018-2019 USC Spatial URAP applications, visit the USC Spatial website at https://spatial.usc.edu/undergraduate/research-field-work/.